Excalibur delivers the goods with this all-male revue starring big, beautiful men, direct from Australia. With tantalizing dance routines and plenty of laughs mixed in, audiences will have a fun-filled, lighthearted time. During the routines, the dancers utilize costume and props to entertain and delight audiences. For those who DO NOT want to see uniforms, the dancers do disrobe to reveal the merchandise, leaving little to the imagination – tastefully. 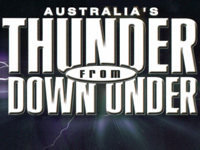 Thunder from Down Under is a Las Vegas bachelorette party every night. It has recently garnered outstanding reviews from the Las Vegas Review Journal, including 'Best Dancers,' much to the delight of the cast. It has been running solidly since 2002 and shows no signs of slowing – a true indication of the show's popularity and value.